The HANDY BRAIN MODEL was created to help clinicians and educators show which areas of the brain are activated during various emotional states. Nonprofessional terminology is used as much as possible but may need to be further simplified, depending on the target audience. Because the HANDY BRAIN MODEL turns 2-dimentional drawings on the mitten into a 3-dimentional object, it lacks anatomical accuracy, but shows the connection between structures. More accurate graphics of the brain are included as necessary. No assembly is required! It simulates the soft texture of the brain better than plastic models. It comes in men’s and woman’s sizes. With the cardboard insert it easily fits teens and adults. 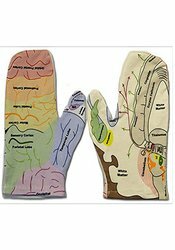 The Temporal, frontal, parietal lobe and Occipital lobe are shown on the back of the mitten. Features of the limbic system (nucleus accumbens, caudate, putamen hippocampus, and amygdala) and insula cortex are shown on the front and back of the thumb. Psychologists and psychotherapists explain (1) neurological “tricks” to reduce anxiety and anger and improve relationships; (2) outline protocols for treating OCD, PTSD, and Impulse Control Disorders; (3) brain-based differences in gender and sexual orientation; and (4) brain changes produced by meditation. Educators can show the location of different brain structures and how they interact. It is appropriate for middle school to college students. Parents can demystify ghosts, goblins, and tantrums by showing children what is happening in their brains. The HANDY BRAIN MODEL is excellent to use with Daniel Siegel’s book, The Whole-Brain Child. Students can use the HANDY BRAIN MODEL for science projects and classroom talks.